After an unknown number of sleepless hours and a seven hour time difference, the plane was closing into Japan. 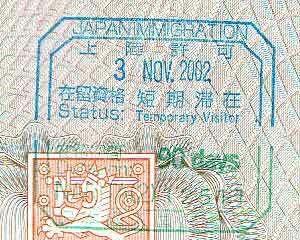 I had to fill out the embarkation card all foreigners - or gaijins as the Japanese call "outsiders" - have to hand over to the Japanese authorities during the passport check. At last the plane landed at Narita airport, which is located about 66 kilometers east from Tokyo. Tired but happy, I left the airplane and got on board a shuttle train that connects the arrival satellite complex to the main building (terminal two). Since I had all my stuff as hand luggage in the plane, I went straight to the passport control, where the officials stamped me as a temporary visitor on the passport and attached a part of the embarkation card to it. After that another official checked my passport again, asked some basic questions and checked my luggage for any illegal goods, I suppose. All this went smoothly and once I passed this last check point I was free to go. Once I entered the arrival lobby it was one crazy ride from there. There were a lot of people buzzing around, but I quickly spotted the information desk. I grabbed some essential maps of Tokyo and then started to wonder how to get there. There was a timetable close by which indicated the times of an express train running from Narita Airport to Tokyo, but I didn't get a proper look at it as an old Japanese woman asked if I needed any help. Wow, now this is something I'm not used to in Finland. Usually if a stranger comes to talk to you, he is probably either drunk, a madman or a tourist. I just said I needed to get to Tokyo station and she showed me the desk where I can buy a ticket (her husband, I presume, was also helping). Surprised by this friendly act of help, I bought a ticket (2900 yen) for the next train to Tokyo station, which would leave Narita airport in 20 minutes. Thanks to the clear signposts, I was able to find myself a few floors underground where the NEX train would stop (which is coming from terminal one). The funny thing was that although I wasn't in a hurry, the highly energetic flow of the Japanese crowd made it almost compulsory to tag along. If I had just stood around, it would have felt just wrong. It didn't take long for the train to arrive, which was on a minute sharp schedule. I also noticed that there was a real person with a megaphone announcing the current trains coming and going instead of hearing it from speakers. Once I boarded the train and found my seat, I couldn't help but wonder about all the things that happened between the ANA airplane and this train. I was quickly snapped back into reality when a service woman with a trolley was selling all kinds of snacks just like on an airplane. When I gathered enough courage to ask permission to take a photograph of the Japanese sitting in front of me, I caught up in a conversation with one of them, who turned out to be working for a rather known electronics company. We talked about various things during the one hour ride, mainly about Japan. He even gave me his business card and personal phone number if I ever needed any help during my stay in Japan. By then I realized the Japanese are a friendly folk indeed. Once I arrived at Tokyo station - a huge seven floor underground complex - I was once again sucked in by the stream of the Japanese crowd and wondered where I should head next (along with other foreigners who were equally dazzled by the chaos in the labyrinth). While wandering around the maze, bathing in the endless noise of masses of people, I encountered something that was in great contrast with the human hurricane. There was this bakery shop selling cakes (there were lots of small shops around the underground station). While the male baker was packing some goods for the customers, he was shouting with a cheerful voice how great and tasty their cakes are. And just beside the bakery, there was this short, young Japanese girl wearing bakery clothes (with the long bakery hat and all), holding a big sign and shouting by turns with a happy smile the same things the guy behind the stand was shouting. It somehow was an unreal moment to see a bright glimpse like that in middle of the chaos. 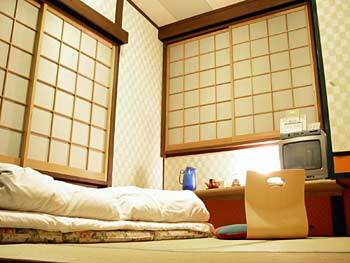 Anyway, I would have to find my way to the traditional Japanese inn or ryokan, from where I had reserved a room before my trip via internet. I had a map I printed from their web site, so I knew what train lines I should use. Soon I found a manned ticket counter and managed to buy a ticket from Tokyo station to Kamata station using the JR Keihin-tohoku line by just saying the names of the stations. After observing how the locals use the ticket machine at the gates, I inserted my ticket into the machine, continued walking forward and picked it up on the other end. I then entered the train and jumped off at Kamata. Finding when to get off was easy as there was a led display that told in Japanese and in English where the train will stop next. During the train trip I also noticed that every station has its own tune they play right before the train leaves the station! After asking directions from the station officer (every station has one), I walked through the ticket gate and placed the ticket into the machine again, which it now kept since I used it and I was leaving the station. I thought Kamata would be a small, worthless location in Tokyo since it wasn't even mentioned in any tourist guide, but it seemed to have all the stores and services in a smaller scale. I wandered around the area a bit before I decided to find a way to the next station. 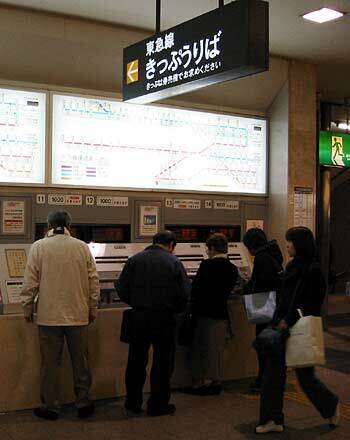 Since this time around there wasn't a manned ticket counter, I would have to use a ticket machine. Now this was a tricky thing, as the train map above the machine was only written in Japanese and I didn't have any idea how much should I pay for a ticket from Kamata to Chidori-cyo (which is close to the accommodation I will be staying at). After fiddling around with the machine for a moment, I accidentally pressed a button which calls the ticket assistant and suddenly a hatch beside the machine opened and there was a Japanese fellow asking me something in Japanese! Well, I didn't understand what he was saying, but then came a young Japanese couple to the rescue and helped me out to buy the proper ticket (they didn't speak English either). They even guided me to the right train they were going to use too and told me on which stop I should get off at. Such kind people! It felt like the Japanese should keep the crowd stream flowing and assist anyone who is lost, otherwise the flow itself might get disturbed and cause even bigger problems. On the train to Chidori-cyo, I took note of two basic things the Japanese do on a train: they either sleep or toy around with their keitai (mobile phone). When I got off at the right station, I was greeted by a quiet suburban side of Tokyo. What a shift from the chaos just a few moments ago! After some wandering around, feeling I was almost whisked here by the flow in central Tokyo, I entered a convenience store to ask directions. The young girl at the desk couldn't speak English, but rather burst into a huge big smile which I couldn't reply in any other way than a big smile and that made her wave her arms franticly, which I thankfully didn't do and we both laughed instead. She knew where the ryokan was and dashed outside saying "righto, lefto!! ", totally overjoyed being able to help me. Indeed the ryokan was where she said it was. When I entered the front garden, I triggered a motion alarm which welcomed me in Japanese. Cute. I went to the reception desk where an old lady - who spoke only Japanese - guided me to my room after paying. The room and the whole ryokan was lovely. I was also given a bath robe (yukata), which I'm supposed to wear while walking around the ryokan. The time was around 9:00pm. Unbelievable journey! Tokyo really fulfilled all I've expected from it and even more. Here I was, about 24 hours later when I left Helsinki, somewhere in Tokyo and not quite fully aware I really was where I've dreamed of being for ages. Recalling the events of the super express trip from Narita to the ryokan, I saw all the basic stereotypes one can see in the streets of Japan: salarymen (lots of them), high school students, trendy teens, older women wearing a traditional kimono, other gaijins and mothers with their small kids. This clash of the new and old, young and elder was a fascinating thing to see. I took a quick walk outside the inn, just that I could sink the fact into my mind I really was in Japan, then returned to the ryokan, took a shower and finally tried to get some sleep. But with my inner clock totally mixed up by now it was an uneasy night. But I didn't care. I was finally in Japan. Lost in Narita Airport (terminal two) with a bunch of other gaijins, but not for long. 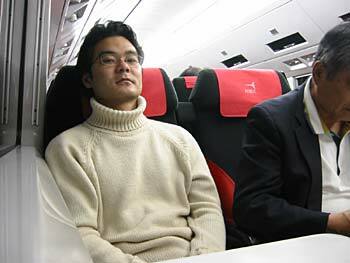 I had a chat with the fellow on the left while on route from Narita to Tokyo. He may look tough, but we shared a few good laughs. My room in Ryokan Kangetsu. Simply a great place and only 4900 yen per night! Tokyo Narita airport - Biggest international airport in Japan close to Tokyo. Narita Express - Special JR Train between Narita International Airport and Tokyo Metropolitan. JR East - East Japan Railway company. 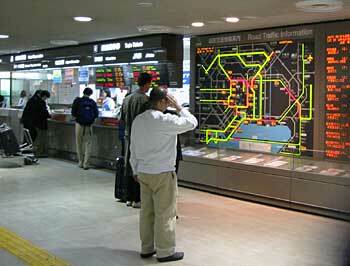 Owns the local train network in greater Tokyo (not to be confused with the separate subway). Ryokan Kangetsu - Excellent Japanese traditional inn in southern core of metropolitan Tokyo.